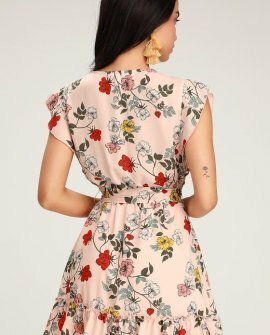 The Jack by BB Dakota Ok Cupid Pink Floral Print Mini Dress will be your go-to for everything from first dates to catching the bouquet! Pink, white, yellow, and red floral print adds romantic appeal to this woven mini dress with a surplice bodice (with modesty snap), fluttering ruffled sleeves, and an elasticized waist with self-tie sash. A tier of ruffles trims the skirt hem for a flirty finishing touch.